Set me free from my prison that I might praise your name(Psalm 142:7a NIV). When my brother was a teenager, my mother used to threaten him when he hunched over at the dinner table. “If you don’t sit up,” she’d say, “I’m going to buy you a back brace from Sears.” I don’t even know if Sears made back braces back then, but it sounded like a pretty good threat to me. Then one night, my father-in-law took care of it for me. We were measuring and marking various family members’ heights on the dining room doorframe. (Yes, you read that correctly—the dining room. Some battles are just not worth fighting). My 77-year-old father-in-law, who stood at about 5’10”, stood with the back of his head against the doorframe. Then he took a deep breath and extended his curved back to its fullest upright position. We marked him at 6’3”. I watched Steven’s eyes grow wider as Papa grew taller. He saw firsthand the difference it made to stand up straight. Papa was huge, but his bent over frame hid his once strong healthy stature. Steven caught a glimpse of the strappingly strong frame that we once knew. From that day on, Steven stood straight and tall. Never once have I seen him slump since. That’s what I’m hoping for you. No more slumping in self-doubt or hunching in half-hearted conviction. But rather standing up to the full stature of a confident woman who knows that she is equipped by God, empowered by the Holy Spirit, and enveloped in Jesus Christ. There are many emotions that cause us to slump spiritually and become crippled emotionally. Worry wears us down. Regret ruins our confidence. Hatred hardens our hearts. Unforgiveness uglies our souls. Bitterness binds our hearts. Insecurity incapacitates our capabilities. I was crippled for many years. Words from my past told me I was “ugly,” “not good enough,” and “worthless.” Inferiority, insecurity, and inadequacy were my three closes companions. I didn’t like these three lurking shadows, but they followed me everywhere I went. Stalkers, that’s what they were. They stalked me, yelling taunts and accusations that no one heard but me. The more I listened to them, the more emotionally crippled I became. Then one day, Jesus called me up front. I didn’t want to go, mind you. I had grown comfortable hiding in the back where I felt I belonged. I could hear just fine from my seat along the wall. The lighting wasn’t as good, but it was enough to get by. It wasn’t long after that words began to flow. From pen to paper, God filled me with words that overflowed to encourage and equip other sisters who needed to experience the same liberating freedom in Christ. So here I am today and you are reading one of my devotions. A previously emotional cripple set straight and shored up by God. Is there something in your life that is crippling your spirit? Unforgiveness? Bitterness? Resentment? Guilt? Sorrow? Worry? Regret? Comparison? If so, cut it loose with the saber of praise, cast it off, throw it away. God calls us sheep; and sheep are not pack animals. We are not meant to carry such burdens with these scrawny legs of ours. If we try, we will only bend under the pressure we were never meant to bear. Oh friend, He is calling you right now. Whatever has been holding you back from being all that God has called you to be and do all that God has fashioned you to do…Jesus has come to set you free! Stand up straight! Do you feel the press of his hand on the crook of your back? Do you feel his index finger under the point of your chin? Lord, I’ve been slumping. Slumping from shame. Slumping from regret. Slumping from disappointment with myself. But today, I am praising Your great Name because You are the lifter of my head! I will stand up straight because You have saved me, cleansed me, redeemed me, and healed my soul. Forgive me for slumping under the weight of what You have already removed. I want to go back and ask the questions I asked in the devotion. Is there something in your life that is crippling your spirit? Unforgiveness? Bitterness? Resentment? Guilt? Sorrow? Worry? Regret? Comparison? If so, cut it loose, cast it off, throw it away. Oh friend, He is calling you right now. Whatever has been holding you back from being all that God has called you to be and doing all that God has fashioned you to do…Jesus has come to set you free! Stand up straight! Do you feel the press of his hand on the crook of your back? Do you feel his index finger under the point of your chin? 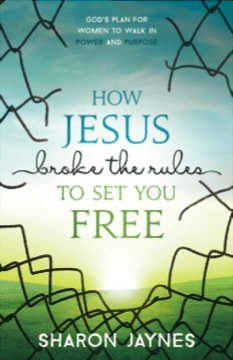 Today’s devotion was taken from my book How Jesus Broke the Rules to Set You Free: A Woman’s Walk in Power and Purpose.Ever wondered just how valuable you, as a woman, are to God? Let’s find out! We tend to read the gospels with our 21st century eyes. But when we understand how oppressive the culture Jesus stepped into was toward women, we begin to understand just how radical Jesus’ ministry, messages, and miracles were at setting women free...at setting you free. He risked His reputation to save theirs…and yours. You’ll write your name into the gospel and see yourself in the lives of the women of the New Testament to fall in love with Jesus all over again! You’ll begin to walk in the power and purpose that God intended all along. Buy this book from any retailer in the month of October, send a copy your receipt to kim@sharonjaynes.com, and receive a free download of the 118-page Expanded Bible Study Guide.